This lovely pendant is made up of 14K rose gold. It shape is like a heart. It is a very simple and decent pendant and this alluring and glamorous pendant has the ability to be engraved with any design or word. The unique design and features makes it a prized possession and owner's pride. Design your look today with this marvelous piece of art and attain the coveted style icon looks. This ornament is skin friendly and will surely be your proud possession for years to come. Engrave up to 2 lines per side, with up to 7 characters per line, including spaces. May be engraved on both front and back (optional). 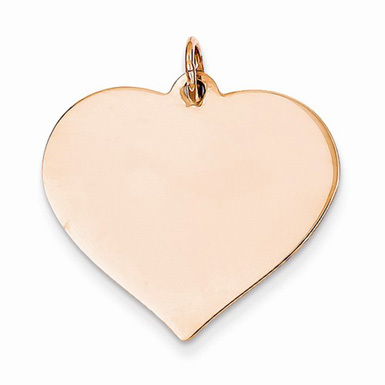 We guarantee our Engravable 14K Rose Gold Heart Charm Pendant to be high quality, authentic jewelry, as described above.